Men’s ice hockey team hosts annual military appreciation night. Despite loss, military game attracts large crowd. 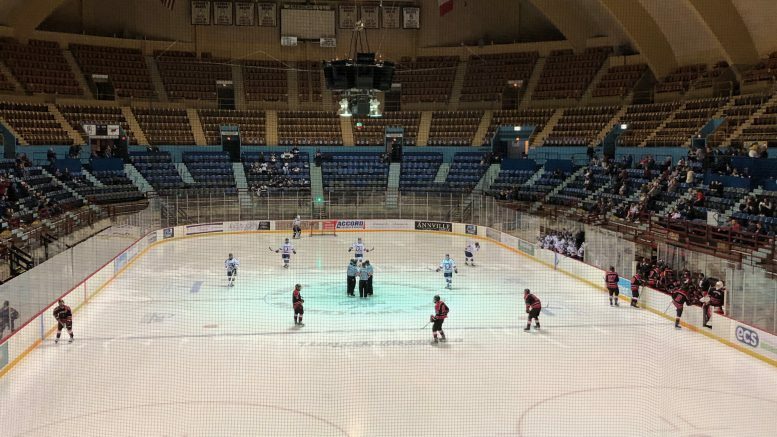 As the season winds down, the men’s ice hockey team faced the Bryn Athyn Lions this past Friday. This year was the ninth year that the team hosted a military appreciation themed game. The team wore special military inspired jerseys that were raffled off after the game. Fans were able to bid on the jerseys on Friday night prior to the end of the game. The program has raised over $100,000 in its nine-year history. Proceeds will be donated to the Keystone Wounded Warriors and the LEEK Hunting and Mountain Preserve. Most of the action happened in the third period. LVC was already down one goal when Bryn Athyn scored again to bring the score to 2-0. The Dutchmen’s first goal came when Skyler Pugh, a sophomore winger, scored a goal less than a minute after Bryn Athyn’s second goal of the game. With just over five minutes in the third period Mike Straub, a senior defenseman, scored a goal to tie the game at 2-2. But less than a minute later Bryn Athyn answered with what turned out to be the game-winning goal. After the game, there was a free late-skate that was open to anyone in attendance. The following day, Saturday, Feb. 9, the Dutchmen fell to the Elmira College in an away match. This loss leaves the team with an overall record of 7-14-2 and 5-9-2 in the UCHC. The Dutchmen will be back on home ice this Friday, Feb. 15 at 7 p.m. as the team takes on the Chatham Cougars. Friday is also Senior night.